The Paella Company has a unique range of paella gas burners so suit all pan sizes, budgets and uses. 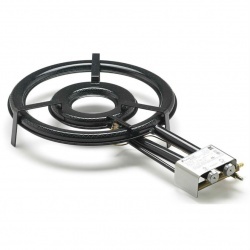 Standard Outdoor Gas Burners - A range of single and dual ring paella gas burners for domestic outdoor use. These are based on a traditional design that has been used for many years. 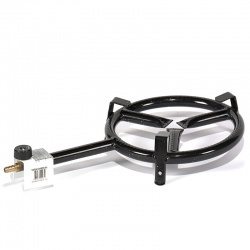 These are teh cheapest of our gas burner range. All our burners will run on either butane or propane and have been adapted by the manufacturers for UK gas pressures. 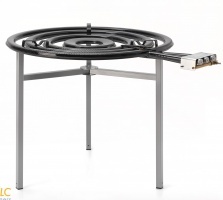 Premium Outdoor Gas Burners - Our range of Premium outdoor paella gas burners are made by the specialist gas burner company, FlamesVLC. They have a very high build quality as well as incorporating patented gas combustion technology. Indoor/Outdoor Gas Burners with Flame Failure (FSD) - The professional range of paella burners come from a specialist paella gas burner company, FlamesVLC in Valencia. The burners include both automatic cutoff devices along with a unique pilot flame mechanism. 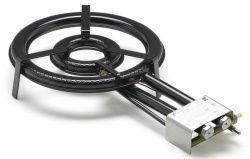 This makes each burner both the ultimate gas burner for home use as well as being fully compliant for GasSafe certification for commercial and enclosed or semi enclosed use (eg indoors or, marquees). 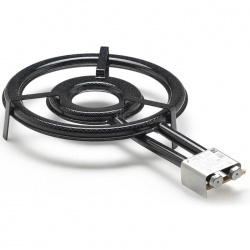 Natural Gas Burners - The professional range of paella burners specifically calibrated to be used with "mains" Natural Gas as opposed to bottled gas. As with our other professional gas burners, these burners include both automatic cutoff devices along with a unique pilot flame mechanism. This makes each burner fully compliant for GasSafe certification for commercial and enclosed situations for which they are normally used.